Rated 3 out of 5 by onhisvine628 from Tedious Although I did somewhat like this game, the repeated scenes and objects to be found was extremely tedious. The mini games did not work for me regardless of which browser I opened this up in. I may try to uninstall and try again. The story line was good though. Rated 3 out of 5 by Mercime from Why are elephants on the ship? It would be a good easy game if you don't care about the hidden objects. Lost are non relevant to the story or the ship itself and looks like someone sneezed into the "hideable objects" folder when the game was created. Unproportionate don't fit into the feel of the game, some way too small or too hidden. Came free in my 20 pack game otherwise I would not bought it. 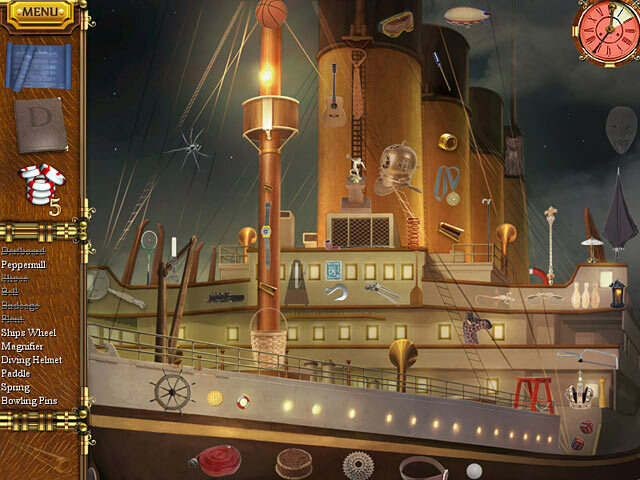 Background artwork is great, but the objects are photos cut out and stren all over hodge podge on the pages. Rated 3 out of 5 by missmadam from Big Disappointment I was really excited about this game, especially after watching the video preview. Unfortunately, the game isn't as great as the graphics. It's strictly HOG, no other puzzles, and it's the same format in every scene. I just thought it was going to be very different. I actually quit playing about 1 hr into the game. Rated 3 out of 5 by kms8314 from Game was ok I started off enjoying the game but towards the end I just wanted it to finish. Overall ok but not one of my favourites. Rated 3 out of 5 by AngelQueen36 from Good Facts This game was ok, played with my 12 yr old. Of course he liked it cause he found all the hidden objects before me. But I was hoping for maybe a few characters besides all the employees coming up in bubbles. Would've liked to have seen the major characters of the love story but guess you can't always have what you want. The facts about the Titantic were good, some I didn't even know about so very historical in a way. 3 stars isn't too bad. Rated 3 out of 5 by skyelady from What a waste The puzzles were way too easy, so were the HOGs. The history info was good but the snarky remarks made by the crew were in poor taste, the sinking was a disaster, and even though it happened a hundred years ago the remarks were uncalled for. I would not recommend this game. Rated 3 out of 5 by game_happy from Enough! I have decided not to continue with this game. HO too small and cluttered. The mini puzzles accomplished nothing in the way of gathering inventory. Not a puzzle fan anyway. No actors or voices. The music was annoying and the constant barrage of ship employees' comments were tiresome. Became bored when I had to keep going back to the same scenes time after time because I "missed" something according to the instructions in each note. Rated 3 out of 5 by IdahoForever from Too easy, too much HOS Based on the demo. The storyline is good, and the characters are interesting, what little you see of them. Graphics are colorful and easy to see, for the most part, although each scene has some translucent objects. Mini-games are super easy. But there are too many HOS, especially when you consider the HOS contain quite a few objects that have nothing at all to do with the story, and seem out of place. 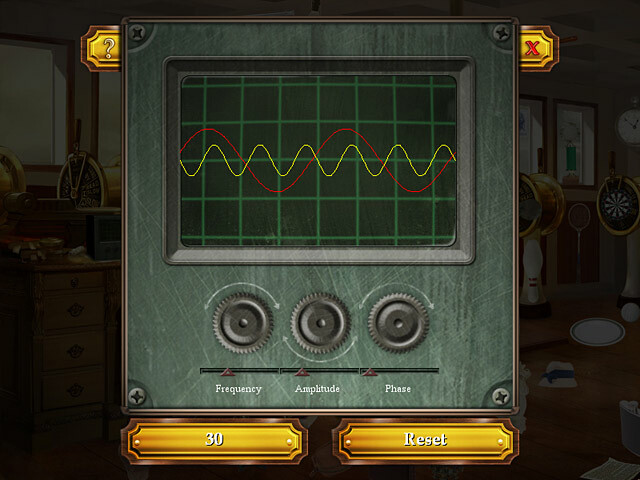 If you like this kind of old-fashioned hidden-object game, then it is perfect for you. I like more adventure and more challenge. 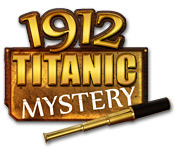 Rated 3 out of 5 by baba247 from 1912 Titanic Mystery This was ok but there are so many more games that have come out since this one,that unless its one of your first its ok but I would not buy it now . Rated 2 out of 5 by effcee823 from Repetitive & boring It starts off with promise of a good storyline but my interest soon deteriorated as it became more and more repetitive. Couldn't bring myself to continue to the end. Don't waste your money buying this game. Rated 2 out of 5 by oldladyplaying from Beautiful but ... This had the potential to be an excellent game, but the artists who designed the HO scenes made the pieces so very small they were practically invisible. A mini-game had lettering that was also minute. No, my eyes are fine, but I lost interest when I couldn't see the lists, much less the items. Rated 2 out of 5 by annglenn2004 from 1912 Titanic Mystery To boring. Nothing to do but find hidden objects that were easy to find. Rated 2 out of 5 by anonny_mouse from One of the more boring HO games out there This game was disappointing. The plot was stilted and flat. The objects in the HOS were really random in their scale and placement. There is also a really annoying sound anytime you click an object. If you are looking for a good hidden object adventure game with an engaging plot, nice graphics and an all round enjoyable experience look elsewhere. Rated 2 out of 5 by Brooke_Lyn from Run!! Don't get on the ship or buy the game!! Strange game to say the least! I thought I was going to like it after the "Trial" so bought it. Had no idea it was just going to keep repeating the same things I had already done over and over! Just when you think you're going to move on you get a letter telling you you've missed some things at the previous locations so back you go but it's just a way to make the game longer! All HOS in the same locations with written blips of true trivia about the Real Titanic! About the first 3/4 of the game there are simple puzzles then they seem to fade away for awhile, come back towards the end. There are no real people in this game just drawings of head shots of 5 crew members and a reporter who's pictures show up and a few lines of true trivia. Don't let the beginning fool you into thinking it's going to be like the simulated news, that's the only action there is! It's a still game, no motion as you would expect with a game about the sinking ship! Locations don't have anything to do with the letters you get. It's completely dis-jointed and boring! It has a little history if you don't know the story at all.. The story they used to make this game in my opinion is silly!! I finished it as fast as I could because I just wanted it to be over! Rated 2 out of 5 by Kasrobn from Dissappointing While the graphics were acceptable if uninspired, this game was simply too easy to be interesting for most adults. I like the brightness of the sunlit scenes, but the familiar subject matter of the Titanic should have provided a much better experience. And the game has no action of any kind, at least in the demo. It reminds me more of a board game, with enveloped letters and conversations appearing like cards from a deck to carry the action forward. The music and sound are irritatingly repetitive providing no atmosphere, and while the "mystery" may have been leading somewhere I just couldn't bring myself to even finish this boring HOS. There are far better games to spend my money on. Rated 2 out of 5 by ziggerzigger from It made me board The howl game was just hidden object and that make me board. Rated 1 out of 5 by eagle1937 from Awful game Not much imagination went into the production of this game. HO after HO. And then we're told to go over them again! And again! This is one game I should have tried before buying. Wouldn't have paid a dime for it. Rated 1 out of 5 by elbmek from Badly Made If you like hidden objects, then this is full of them, no story, just hidden objects and all repeat themselves to accentuate a very bad game. It is not even worth it for free. Horrible and waste of money. 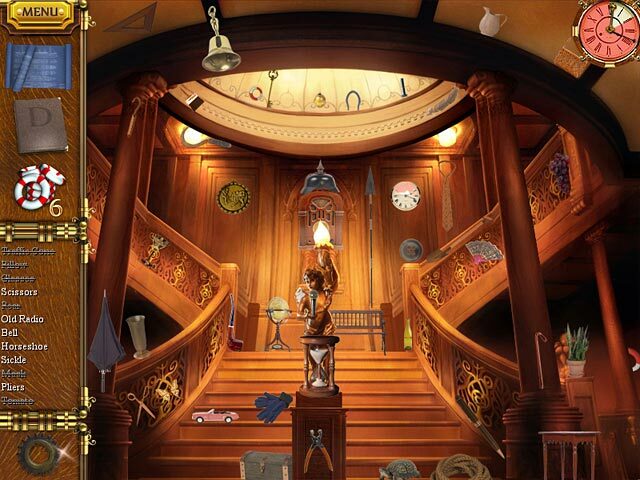 Like all hidden object games many items are not named correctly, eg: looking for a wrench? Then its a spanner? Looking for a wrench? It might actually be one this time? Rated 1 out of 5 by zumapuma from Didn't find this enjoyable at all Sigh...well two dogs in a row for me. Didn't even finish 15 minutes of the trial. HO's senseless and boring. Action uninteresting. Rated 1 out of 5 by recover413 from Horrible!!! If you are looking for a child's game then this one is for you. The game is repetitive throughout. The same thing over and over again. There is not a challenge because it is too easy. I thought it would be great, however, it was actually for a 5 year old. Rated 1 out of 5 by jashart from I must respectfully disagree... The other reviewers seem to find merit in this game that completely eluded me. To begin with, it hit my pet peeve button with the "hidden objects" that are of random scale, floating in air, have no relevance to the story, etc. The puzzles themselves are completely lacking in challenge or originality, and for such a simple game the whole thing just seems to drag on and on. Playing this made me wish I could have the time I wasted back again.